A few months ago, English journalist Rachel Rickard Straus wrote an article entitled “How I swapped a medical trial for a free holiday in Mexico” and published on the telegraph.co.uk website. This is an interesting variation on the increasingly important field of medical tourism, much studied by geographers over the past decade or so. 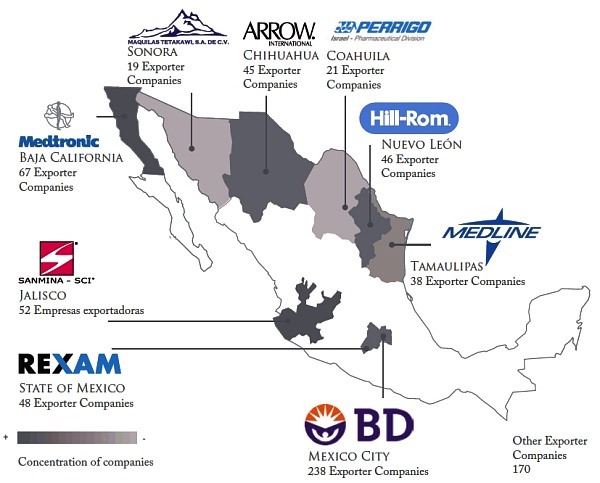 Several forms of medical tourism have been important in Mexico for a long time, mainly because of the significant price differential either side of the USA-Mexico border for almost all medical and dental procedures. Guadalajara was one of several cities where Americans could afford cosmetic surgery at the hands of (often) American-trained experts at a fraction of the cost back home, and were able to recuperate in relative luxury away from the preying eyes of family and colleagues. Ms Straus appears to have thoroughly enjoyed her free holiday and apparently suffered no ill effects from the medical trial. Or did she? Her article describes how she “lapped up the Mexican sunshine, admired the incredible Mayan pyramids and even took a road trip to San Miguel de Allende, a world heritage site.” This is fairly remarkable, since she managed all this without even leaving central Mexico! Presumably she actually meant either Aztec pyramids (if she visited El Templo Mayor in downtown Mexico City) or, much more likely the Teotihuacan pyramids, where Ms Straus had her picture taken. Archaeologists do not know all that much about the people who built the Teotihuacan pyramids, who are usually called simply Teotihuacanos. As any Mexican 5th grader knows, the Maya built their pyramids far to the east, in and around the Yucatán Peninsula, where sites such as Uxmal, Chichen Itza, Palenque, Calakmul and Tulum, among dozens of others, are proof of the Maya’s very considerable architectural skills. When Mexico braced herself for the imminent arrival of cholera from South America in 1991, many people believed that the disease had never previously been known here. However, during the 19th century, there were several outbreaks, including the epidemic of 1833 in which more than 3,000 people died in the city of Guadalajara alone. A meeting of public health officials in January 1833 stressed the need for public areas to be regularly cleaned. This meeting called for the construction of six carts, to be used each night for removing the excrement left on street corners, since not all the houses had “accesorios” (toilets). This proposal reveals the unsanitary conditions which prevailed in Guadalajara at that time. The epidemic struck in July, and peaked in August, when more than 200 people died of the disease each day. Sporadic cases dragged on into early 1834. Only two methods of sewage disposal were in use in 1850. Some houses took their sewage to the nearest street corner, where it was collected by the nightly cart for subsequent removal from the city. Other (higher class) houses deposited their sewage in open holes in the ground which allowed the wastes to separate, with the liquids permeating into the subsoil and the solids accumulating. Not exactly ideal in terms of public health! The town council called for the construction of more of these latrines and for the activities of the night carts to be reduced. During the 1833 epidemic, various industrial plants, including ones making soap, starch and leather, had been closed, though no regulations were ever passed for their subsequent improvement. This time, in 1850, more drastic measures were taken. Tanneries had to construct their own watercourses, and their water was not allowed to collect and stagnate by bridges. Soap works were transferred out of the city completely. Despite these efforts, many stagnant pools of water would have lain on the city’s poorly constructed cobblestone streets: pools of water just waiting for an outbreak of cholera. The police force was given the power to supervise everyone’s adherence to the regulations. Inspectors were appointed for each district or barrio to see that all “night activities” (carts included) terminated before 8:00 a.m., that sewage water was not used for the irrigation of plants, that gatherings were not too large, and that billiard, lottery and society halls all closed at the start of evening prayers. A group of doctors was obliged to give its services free to anyone who needed medical help. The doctors apportioned the city among themselves and were told by the town council that they would be paid for their services as soon as council funds permitted. The main idea, of course, was to help the poor, perhaps not so much from any altruistic motives but to avoid any inconvenience to the rich! Fortunately, any new outbreak of the disease in modern Guadalajara will be handled very differently to these 19th century epidemics. The excellent modern medical facilities in the city, and the large number of qualified doctors, mean that anyone unlucky enough to contract the disease should be able to get adequate treatment ensuring a full and speedy recovery. 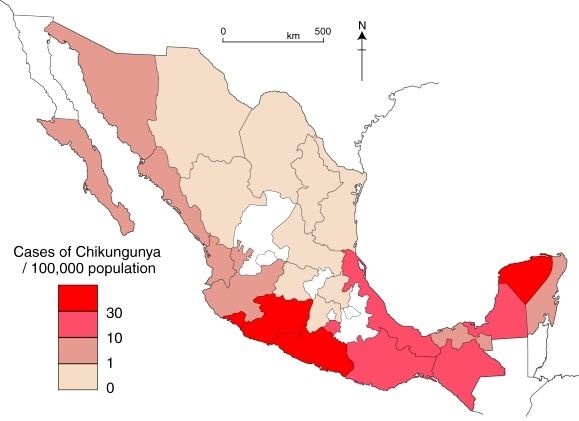 Note: The diffusion of cholera in Mexico during the 1991-1996 epidemic is discussed, alongside a map showing the incidence of the disease, in chapter18 of Geo-Mexico: the geography and dynamics of modern Mexico. Geo-Mexico also includes an analysis of the pattern of HIV-AIDS in Mexico, and of the significance of diabetes in Mexico.